The Pinot Gris is from Kalala’s certified organic Westbank Vineyard. The morning sun exposure brought maximum ripeness to grapes while the cool summer evenings maintained the vibrant acidity. Cold-soaked for 6 hours for ideal acid/sugar balance and additional aroma extraction. Two separate fermentations. 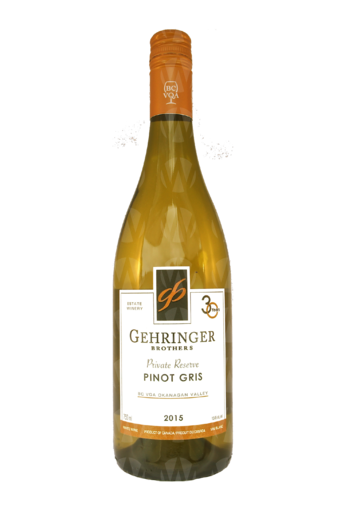 The Pinot Gris was picked in three separate batches for better balance in the wine. Staggered picking at Kalala Westbank vineyard block C and B.
Aromas of honeysuckle, pear, and refreshing citrus. Flavours of lime, lemon, pear, and white nectarine. Offers a refreshing twinkle of acidity, a saline-like minerality, and a weighty mouth-feel. Pairs well with fresh vegetables, raw fish, and lighter meals.